I want to help people be free of the crushing weight that philosophical naturalism burdens upon people’s view of themselves and of each other. With the apostle Paul's perspective in mind, I think naturalism is a spiritual stronghold that does not free people to have knowledge of God. And as John Calvin has noted, knowledge of self is intimately tied to knowledge of God. Philosophical naturalism is not worthy of the dignity that is rightly inherent to being a human being; it has failed to deliver knowledge about the very thing that makes us human: a substantial soul. Not surprisingly, naturalism fails to account for other nonphysical yet real and integral facts to what it means to be human, including the reality of consciousness, free will, rationality, objective morality and intrinsic value. These facts are recalcitrant. A recalcitrant fact is one that is obstinately unco-operative in light of attempts to handle it by some theory. A theory may explain some facts quite nicely. But a recalcitrant fact doggedly resists explanation by a theory. No matter what a theory’s advocate does, the recalcitrant fact just sits there and is not easily incorporated into the theory. In this case, the recalcitrant fact provides falsifying evidence for the theory. Why should philosophical naturalist assumptions about human beings be trusted? Why should we accord to them the authority to guide our beliefs and knowledge about what is real about the human person? 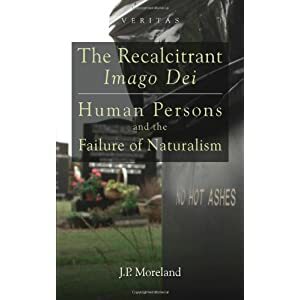 The Recalcitrant Imago Dei, in part, tries to offer some philosophical interactions with naturalism’s view of the human person in such a way that answers to these puzzling questions can be considered. In chapter 1, I setup an interaction between naturalism and its rival, theistic realism, and argue that if there are recalcitrant facts (in the sense that I specify above), given naturalism’s ontological commitment, they would not only provide disconfirming evidence against naturalism but would also provide confirming evidence for theism. Chapters 2-6 then provide the evidence for my argument. Chapter 2 focuses on naturalistic accounts of consciousness. In this chapter, I utilize my “argument from consciousness” (especially developed in my 2008 Consciousness and the Existence of God) and interact with naturalists Paul Churchland, D.M. Armstrong, Frank Jackson, John Searle, Jaegwon Kim, Colin McGinn, and David Papineau, in order to show that at least phenomenal consciousness is a recalcitrant fact, especially when one considers the explanatory power of theism and the deficiency of other alternative accounts to naturalism on this issue, such as, panpsychism. Chapter 3 considers the fact of libertarian free will, and how it is inadequately accounted for by leading naturalists (such as those listed above), but especially Daniel Dennett and John Searle. Given the commonsensical intuitions of libertarian free will, it also turns out that naturalistic accounts end up talking people out of their ordinary experience. There is not and nor will there ever be a plausible explanation concerning how one can start with dead, brute, non-teleological, law-governed matter with passive liabilities and generate the sort of ontological agent required for libertarian freedom by simply rearranging the parts into new external relations. It would be an act of magic if a naturalist could pull-off such an explanation. Thankfully, theism does not need to exercise such mental gymnastics in order to explain that libertarian free will is real. Chapter 4 addresses the ontology of rational deliberation (e.g., reasoning through a chain of inductive or deductive premises and drawing a proper conclusion). Given the ontology of such acts, it is easy to see (in fact, its predictable!) how they could obtain in a theistic world because the fundamental level of being – God – exhibits this ontology himself. But given that brute, non-rational, non-teleological, physical-causal-law-governed material stuff is bereft of this ontology, it is hard to see how that ontology could obtain, given naturalism. So, I argue that the features of a rational agent and the process of rational deliberation are neither reducible to nor eliminable in favor of a naturalist ontology of human rationality. Lastly, I incorporate Alvin Plantinga’s argument against evolutionary naturalism in this discussion, along with supplementary considerations of my own, and defend this as an argument against naturalism. Chapter 5 offers a basic case for a substantial, simple soul based on our basic awareness of ourselves, the fact of sameness through mereological replacement, from the concept of a spiritual substance, and from various paradigm cases. There are two reasons why a substantial, simple soul is not an option for a naturalist. First, if by some sort of magic, a simple soul could be an emergent entity, then given the naturalist commitment to the “closure of the physical,” the soul would be an epiphenomenon with no causal powers. How would that be effectual? Second, given the combinatorial processes constitutive of the Grand Story of naturalism, apart from atomic simples (if such there be), all larger wholes are mereological aggregates composed of separable, substantial parts that stand in various external (e.g., spatio-temporal, causal) relations to each other. But mereological aggregates are not simple substances, and certainly not simple souls or egos. This is why (among other reasons) there is a problem with mereological aggregates for also a material constitution view of human persons (Lynne Rudder Baker), which I also address in this chapter along with the mistaken view of persons as emergent agents (Timothy O’Connor). Chapter 6 shows that some form of non-cognitivism or ethical naturalism is the best way for a naturalist to proceed in metaethics since a commonsensical view of moral actions and equal value/rights are hard to sustain in naturalist worldview. I show how naturalism has difficulty sustaining objective intrinsic value and moral law, a robust view of moral action. Lastly, I argue that the conjunction of naturalism and evolutionary theory fails to have the resources for sustaining high, equal value and rights for all human persons simply as such. If philosophical naturalism should be trusted as a compelling theory to better explain basic facts about the features of human persons, and in light of theism as a competing theory, it does not seem that such trust is rooted in any persuasive philosophical reasons. Perhaps one wants to trust naturalism to deliver the goods because of its dismissive strategy (that acts like a psychological crutch) against God. That at least seems to be a tactic of Thomas Nagel, which I address in the Appendix. Where should the discussion go between philosophical theists and naturalists? I think naturalists increasingly owe us an account of why these five features sketched in the book seem so obviously true to commonsense and first-person introspection. And for those who embrace a commonsense perspective about any one of these features I identify in the book, I would like to see an account of how this feature could come to be in a purely physical universe. It was a privilege to have The Recalcitrant Imago Dei be part of the SCM “Veritas Series” in association with the University of Nottingham’s Centre of Theology and Philosophy. With joy, I dedicated The Recalcitrant Imago Dei to my colleague and dear friend, Frank Beckwith, because his life and work is a sturdy lover of the imago Dei. It is a resourceful text for upper undergraduate and graduate courses about Philosophy of religion, Philosophical anthropology, Philosophy of mind, Comparative world religion approach to what it means to be human, Philosophical ethics and naturalism, Libertarian freedom and determinism. Each chapter stands on its own merit and so the book can be useful for select course readings on a specific topic or read together as a single presentation. It reliably interacts with the major influencers on the topic of naturalism and the human person and it provides a handsome model of research on these matters. Table of Contents: 1. Naturalism, theism and human persons : identifying the central crisis of our age -- 2. Naturalism, consciousness and human persons -- 3. Naturalism, free will and human persons -- 4. Naturalism, rationality and human persons -- 5. Naturalism, a substantial soul and human persons -- 6. Naturalism, objective morality, intrinsic value and human persons.